Oftentimes, people will pay top dollar — sometimes as much as $2,000! — for contractors to draw up garage plans and mother-in-law suite house plans. But did you know that you can find these types of house plans at our website, for much less than that? Your garage doesn’t just have to be a place to store your car and lawn equipment. Having a separate garage opens up a world of possibilities for you. You can use your detached space as a workshop, a game room, a place to house your home business, or even as a separate apartment. No matter what you decide to do with your garage, we’re bound to have the perfect solution for you. Our garage plans are truly spectacular and will give you a space that you’ll love. We’ll explore several garage space ideas, including mother in law suite floor plans and workshop plans, to help you get inspired. For those who want to maximize the potential of their garage, having a mother in law suite or workshop is a viable option. A mother-in-law suite, also known as an inlaw apartment, is an accessory apartment added to an existing residence. Oftentimes, mother in law suites are built above a garage. Many of our plans for garages feature in-law suites as part of the design, transforming a boring space into a glamorous apartment. Plan #149-1838 offers a contemporary take on the mother in law suite. Nestled above the two-car garage is an apartment with a gorgeous wrap-around balcony. With 9-foot high ceilings, the upstairs apartment makes a great living or work space. Plan # 149-1748 is a two-bay garage plan with a 675 square foot apartment upstairs. This cozy upstairs apartment includes a bedroom, bathroom, kitchen, and living room with a spacious window for lots of natural light. Plan # 163-1041 is a two-bay plan with a spacious upstairs garage apartment. The apartment includes a kitchen, living room, bedroom, bathroom and walk-in closet — just about everything you need. If you’re fond of working with your hands, a workshop may be more your style. These garage shop designs are perfect for working on cars, bikes or just about anything else you can get your hands on. Plan # 160-1019 is a spacious garage plan with enough room for RV storage. It features a 14’ x 13’4” workshop with 8-foot high ceilings and a dedicated workbench for the ultimate DIYer. Plan # 160-1016 is a two-story garage shop plan with ample work and storage space. The first floor features a two-car garage with a workshop and workbench in the back, while the second floor houses a 35’ x 23’ storage space with vaulted ceilings. Plan # 108-1075 is a two-story plan that offers something for everyone. Not only does it have a workshop and covered storage on the first floor, but the second floor is home to a 37’ x 10’8” loft, an office, bathroom, and even a balcony. Whether you’re looking to transform your garage into an apartment, workshop or office space, The Plan Collection has you covered. 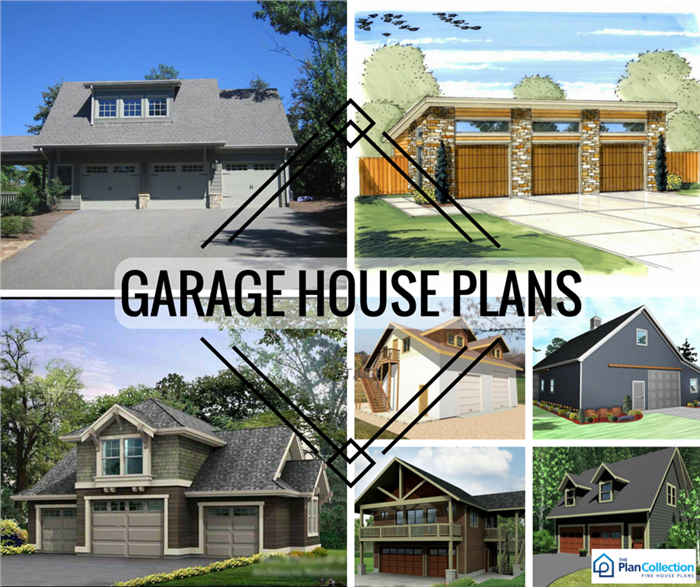 Our collection of garage plans offers designs for every style and need, and we’ll be happy to help you find the best fit for your home. If you can’t find exactly what you’re looking for, or if you have any questions about our garage plans, contact us today and we’ll gladly assist you.